It occurred to me last week that I don’t care about the Academy Awards this year. Not a big deal, of course — lots of people don’t care about them — but this is sort of unusual for me. 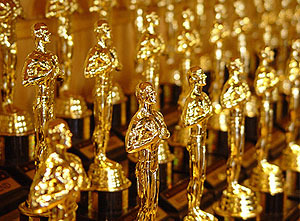 I’m not a huge film junkie or anything, but I probably see 30 or 40 movies a year and I always love watching the Oscars. It’s the only awards show I like. But this year? Eh. If I miss it I won’t care much. It’s the movies themselves, I guess. The odds-on favorite for Best Picture is Slumdog Millionaire, a movie that was entertaining enough to watch but that wore badly on me the more I thought about it. The game show schtick began to fray about halfway through, and the rest of the plot contrivances were worthy of a mediocre cable drama series. If this had been an American movie made in Hollywood, it wouldn’t have gotten a second look from anybody. And the rest? I enjoyed Benjamin Button, but it’s an inch deep. Frost/Nixon was OK but never really did much for me. The Reader left me entirely cold. By process of elimination, I guess that means my favorite is Milk, which had a great performance from Sean Penn but was otherwise pretty flat. And the Best Actress category? What a travesty. Melissa Leo gave the best performance of the year, but Nate Silver says she has a 0% chance of winning, and who am I to argue with Nate Silver? The two top picks, Kate Winslet and Meryl Streep, gave performances that I thought were grotesquely bad, and I can hardly stand the thought of seeing one of them take home the statue. On the other hand, I’m OK with Heath Ledger winning for his Joker portrayal, and both Mickey Rourke and Sean Penn are good picks for Best Actor. So it’s not all bad. More broadly, though, I can’t remember the last time there wasn’t even a single movie whose chances I cared much about. How about you?